Dental treatment cost is a very important matter when it comes to visiting Mexico for dentistry. Some people do a lot of research to find a suitable dentist who offers quality dental work at a reasonable cost. Others focus their decision based on online dental price comparison. It’s easier to make the mistake of just focusing on the dental cost in Mexico. Unlike in the US and Canada, many Mexico dentists post their dental price list online. It exposes the universal truth that there are variations in fees when it comes to dentistry. At Dayo, we always argue that quality should always be a priority over price. After all, you are already saving significantly on your dental cost (50-70%) by going to Mexico for dentistry. Why do dental costs vary in different clinics in Mexico? 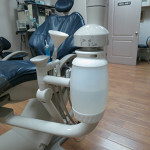 Dental cost also involves maintaining a clean and modern dental facility. In the picture above taken from our partner dentist in Tijuana, Mexico, your doctor takes pride in having a clean, safe, and modern dental clinic where you can have Peace of Mind as you sit on the dental chair. There are many reasons why dental treatment fees in Mexico vary from one clinic to another. It can be due to the differences in experience level, service and quality. Just imagine when you buy a computer or handbag in a mall. Of course you want something cool and appealing but I bet you’d definitely want something over another because you already have an idea of its quality. You’ll surely look over cheaper brands but will definitely pick the durable and name brand item even if it’s more expensive. Some Mexico dentists charge a premium, but argue that they maintain better quality and stricter safety and infection control standards. Some dentist in Mexico even charge close to US prices. On the other hand, some dental offices in Mexico focus more on volume as opposed to quality. They price their dental work cheap to attract price shoppers. Although some still provide good quality at a discount, others cause a huge headache for some dental tourism patients who go back with faulty teeth work. Materials such as top dental implant brands (vs generic brands) are more expensive. In almost any skill based service, more experienced professionals charge more than new or less skilled professionals. Some dentists prefer to spend more quality time with each patient as opposed to going for volume. 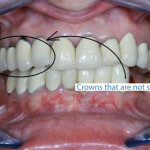 Dentist spends more time on your crown preparation. 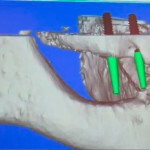 Dentist spends more time evaluating and planning your case to anticipate mistakes and deliver the best treatment result. Dentist focuses his attention to your optimal and convenient experience. It’s always disheartening for us to receive a call from a desperate patient who received faulty dental work from other dental clinics in the US and Mexico. Rework can easily double or triple your dental cost, plus the toll on your health (and sanity!). If you choose a specific dentist that has the training, experience, and successful track record at a reasonable dental price, you’ll be in good hands. We want to help educate dental travelers to be smart and value shoppers. We want everyone to have a good experience when they travel to Mexico for dental care. We want you to choose the doctor that suits your budget but will deliver the quality you deserve. Need more advice about dental cost in Mexico? Call Dayo to inquire about getting Safe, Affordable, and Superior Dental Care in Mexico. 877-987-3296.